This is the original that Denise Williams painted and then (mostly) worked before making the pattern in the back of Crewel World. Denise and I visited the real horse in the Minneapolis Art Institute, and then bought a a postcard with a color photo of the horse on it. My editor complained that this pattern was rather complicated, and so the next two patterns will be easier to work. Because this pattern is spread over two pages in the book, I have also put a copy of the pattern below for you to download. I will alternatively mail a print of the pattern (without the key) to anyone who asks for it. 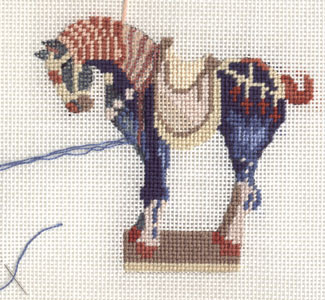 This is the T’ang Horse as worked in cross stitch by Virginia Berringer, friend of the author. This is the pattern by Denise Williams for Crewel World. Note there is no key to the design. I want you to buy the book.